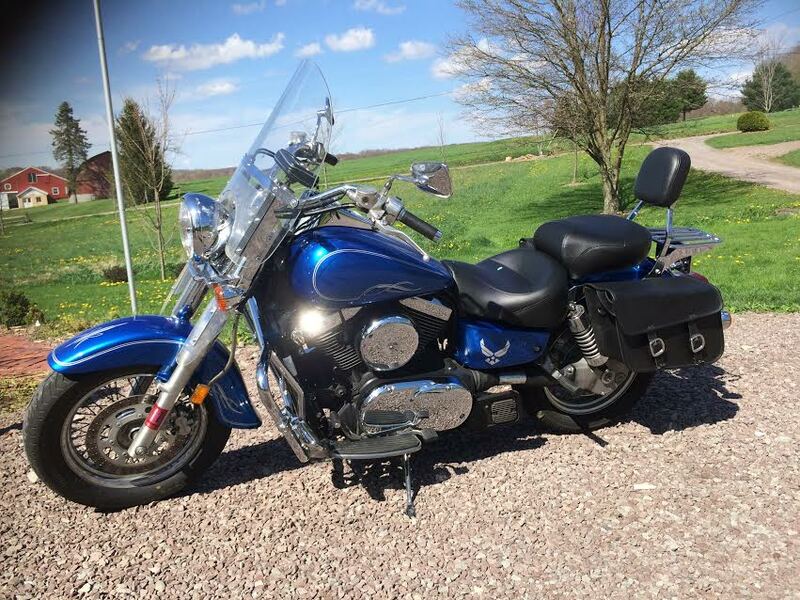 In the bike accident last summer, Sam's bike really got off easy. A scratch here, a tiny dent there, and that was about it. The unfortunate part is that the tiny dent couldn't be repaired without damaging the paint, and that required a new paint job. Vehicles are ridiculous that way. We debated for a while about whether or not we wanted the same color, or to mix things up and do something different. And then since we could, we debated customizing it. After many months of not really thinking seriously about decisions, we came to the mutual agreement to change from red to blue paint. I let the customizing to Sam's discretion. It's his bike, after all. 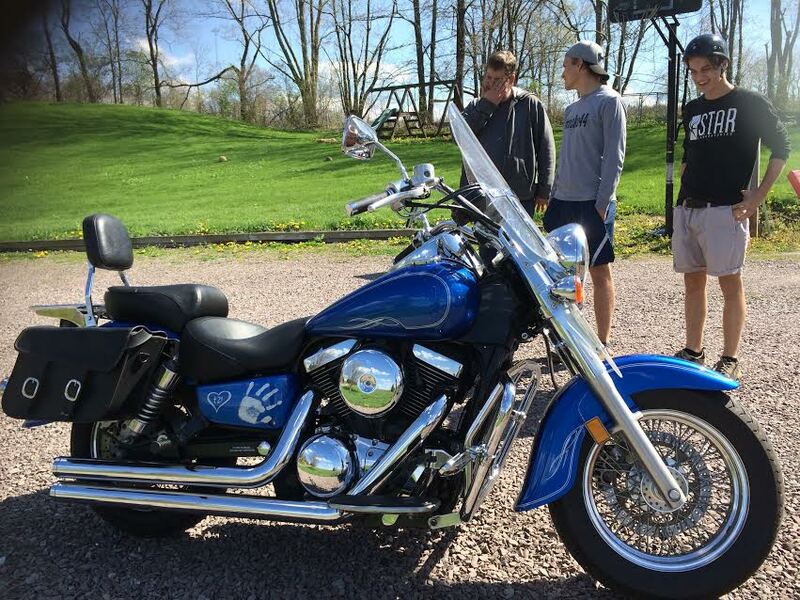 The plan was to paint the bike, take it to Sam's uncle who does custom pin striping, and then have it clear coated to seal in the customized details. In the few days between the painting and the pin striping, one of the boys, who shall remain nameless (not Micah), splashed paint on the newly painted pieces. That was not a good day. I'm just saying. We're all grateful that the splashed paint mostly came off, and what didn't was able to be covered by the pin striping. Sam chose to have the Air Force emblem painted on one side of the bike, as a nod to our early years, and a symbol for Down syndrome on the other side. Those are two events that really changed our lives. They deserved to be recognized. 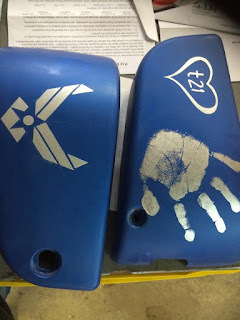 The plan for the DS side was to use Micah's hand print, with a DS symbol inside it. This means that we had to take Micah along with us, and hope that he was cooperative. And feeling artistic. And cooperative. Did I mention that? All concerns were unfounded (mostly because I wasn't in charge, but daddy was), and the hand print turned out exactly perfect the very first try. In fact, it was far better than perfect. His singular palm crease shows, which is a statement to his DS in itself. We didn't want to mess up the perfect print, and were so thrilled to have that forever sealed into the bike's paint, that we chose to put the symbol beside it instead of on top of it. 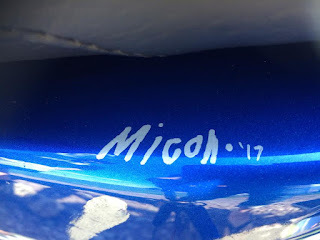 And then, because we could, we decided to have Micah sign his name. The rest of the bike's customized paint came out stellar, too. Sam's uncle does all the painting free-hand, with no stencils or stickers. He's amazing to watch in action, and does a phenomenal job. In fact, Micah's name was painted on by the artist, copied from a signature Micah did on paper. We didn't want Micah to think that he could, at any point in the future, write on the bike with a Sharpie. But guys, that is Micah's signature. He captured it exactly. Thankfully, nothing happened to the paint job a second time, and the clear coat was applied with no further difficulties. We have a definite one-of-a-kind bike, and in the event we ever sell it, we'll be replacing that one piece with Micah's hand print on it so that we can keep it forever. That's a-mazing! Such a great idea to preserve such a unique part of Micah, and it turned out perfectly!